What are the properties of alumina ceramic shafts? How do ceramic shafts and bearings work? How are ceramic pump shafts made? How much do ceramic pump shafts cost? Thirty years ago, Grundfos in Denmark was a pioneer in this field by using alumina ceramic shafts in their central heating circulator pumps. Since that time, Grundfos alone has built around 30 million pumps using ceramic shafts and bearings, most of which are still running today - so we can say quite safely that these materials work well in this application! The reason that ceramic shafts working against ceramic bearings are so good when working under water or process-fluid lubricated conditions, is not because the ceramics are inherently "good", i.e. low-friction, bearing materials - they are not! If the pumps run dry, the bearings start to squeal and eventually seize up or otherwise damage themselves. For wet running, they work well because the ceramic bearing and shaft are very hard indeed and so are able to grind up and disperse foreign materials such as limescale, rust or sand particles which happen to get into the bearing area. For the best running conditions, quietness of bearing and longevity, the alignment, surface finish, roundness and tolerances of the ceramic components have to be to a very high standard. In such a case, the bearings function hydrodynamically, with a thin film of process liquid separating the rotating elements. However, for applications like small garden fountain pumps, the materials work quite well enough with just unground surfaces on the inside of the bearings. No hydrodynamic action is present but the boundary lubrication of the surfaces is enough to give a relatively long life and a low enough friction level. Alumina ceramics are also immensely strong - if you use them in compression. "High tensile" steel has a yield strength in compression somewhat over 1,000 MPa. Alumina ceramic has a compressive strength of over 2,000 MPa! Unfortunately for us, it's difficult to design a shaft to work purely in compression, so the more useful parameter to consider is the flexural strength of the material. The flexural strength of 95% alumina is approximately 330 MPa, which compares with brass (300 MPa) or mild steel (385 MPa) - so it is to be considered as a medium strength material. Ceramics are very stiff. The Young's Modulus for steel is 200 GPa, while for alumina ceramic it is 350 GPa. This is both an advantage and a disadvantage of ceramics. 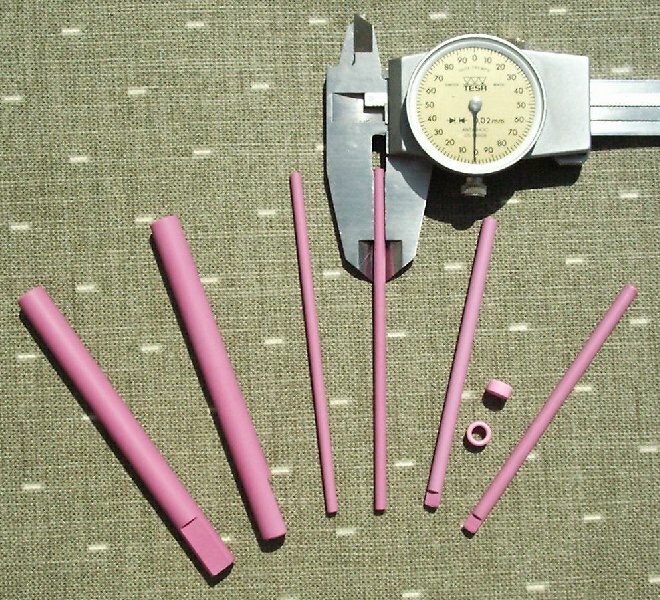 While it means that elastic bending of the shaft will be very small in service, allowing a very precise pump to be built, it also means that if misalignment or bow is forced into the shaft, perhaps by lack of precision in other components, the resulting stress in a shaft strained to a pre-determined degree will be much greater, perhaps leading to failure. How are ceramic shafts made? Once shaped to a near-nett shape, it is Sintered at a temperature of around 1,600�C for a furnace cycle time of around 36 hours, and during this sintering the material densifies by around 60%, shrinking by about 20% in each dimension, and taking on its final mechanical and chemical properties. 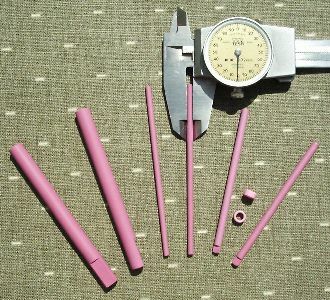 During the sintering process the material becomes quite plastic, and this means that shafts tend to bend during firing unless special techniques are used to keep them straight. The sintered shafts now have to go through at least one Diamond Grinding process to reach the desired degree of precision. Usually this is done on a centreless through-feed machine with a diamond wheel which is as long as possible. Several passes through the machine are required, since each pass only can take off a relatively small amount of material. Diameter tolerances at this stage may be as coarse as �0.02mm for light duty products, or may be as tight as 5 microns for the best performance. Superfinishing of the shaft may be called for as a final process to improve the surface quality to a polished finish and to improve the roundness of the shaft. The material is capable of giving surface finishes as low as 0.05 microns Ra, though normally 0.2 microns Ra would be the finest finish necessary. How much do ceramic shafts cost? Alumina powder is a relatively inexpensive material, but the long list of production processes necessary to make a finished shaft indicate that the cost of the raw material is not a good indication of the cost of the final product. The price of finished ceramic shafts can be anywhere between �0.30 for a small, ground-only shaft produced in quantities of 50,000, to several � for a larger high precision shaft made in smaller volumes. Avoid changes in diameter on the shaft O/D. Reduced diameter zones or steps are possible, but bear in mind the need for through-feedable centreless grinding for cost-effectiveness. The reduced zone or step will have a bigger diameter tolerance and may be eccentric to the ground surface. Below 5mm dia, making the shaft smaller does not necessarily make it cheaper, since grinding of small diameter products is much slower. For iso-pressed products, build in as many internal design features as possible, since they are 'free-of-charge' once the tooling is established. Avoid tight tolerances on anti-rotation flats, so they can be machined before sintering. Avoid specifying chamfers on smaller diameter shafts since the grinding process will make them uneven. A small tumbled radius to break the sharp corners can be provided inexpensively.